It’s highly possible that I’m no longer rational in my love for NIkolai Gogol. He may not actually be as wonderful as I think he is. So be warned. I’m a Gogol fanboy. The Nose is the story of Collegiate Assessor Kovalyov who wakes up one morning to find that his nose is gone. Aware that he will most likely lose his position in the civil service if he appears in public without his nose, he immediately begins to look for it. To his shock, he discovers his nose at church where it has already assumed a circle of friends and a civil service rank higher than his own. When his nose refuses outright to return to his face, Collegiate Assessor Kovalyov his few options left him and sinks into despair. 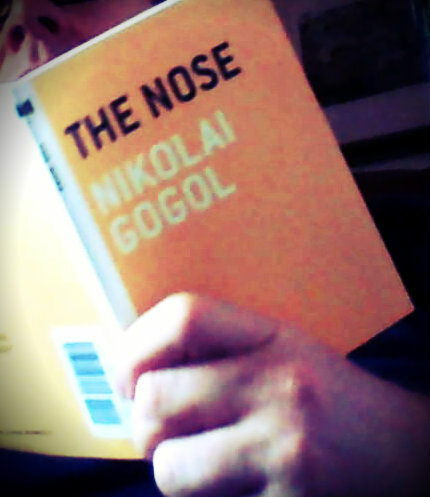 Like much of Gogol’s work it’s hard to tell if The Nose is really a finished product. There are two complete stories in the slim volume published by Melville House as part of their Art of the Novella series. In the first story, a lower ranking civil servant finds the nose in his morning bread loaf. How it got there he can only speculate. Since he cannot come up with a way to return the nose to Collegiate Assessor Kovalyov who outranks him, he takes the nose to a nearby bridge and tries to surreptitiously through it into the river. That he was able to tell whose nose it was shows you just how prominent a nose we’re talking about here. Afterwards, the second, more familiar story begins. I’ve read The Nose several times, but never encountered this pre-coda before. Is there a term for a coda that comes before the story begins? This tale before the tale and the kind of loose way Kovalyov finally gets his nose back in the end leads me to wonder if Gogol was really finished with The Nose. I still love the story. I would still love to sit in on a graduate seminar on Gogol, but this time around I felt the ending was a little problematic, not as problematic as Gogol’s wonderful novel Dead Souls which really was never finished, but a little too loose. Of course, what happens to the nose is not really the point of The Nose. I confess that I may have written this entire review just to make that sentence possible. I’ve enjoyed the little Gogol I have read. I think he might be one of the more accessible Russian authors. Nice review! Thanks. I’ve found the Russians to be a much more reader friendly bunch than most people suspect. You know, it could be a grown-up got-your-nose game now that I think about it. I’ve called Dead Souls the greatest novel of the first half of the 19th century, so I say you’re plenty rational. This idea that “The Nose” Is unfinished is a puzzler. Of course it was finished. It is a complete text, published in a magazine, etc. Does the Melville House book bother to say anything about the other story, the coda? I was wondering how they got to 64 pages with a 25 page story. I wonder what it is? Since I do not want to be argumentative, this is an aside for anyone but CB – Dead Souls is a complete novel, “finished.” It has an unfinished sequel. I knew you would call me on this, Tom. You’re right that both pieces are finished in that both were published, etc. Melville House’s edition comes in at 45 printed pages. Calling the story a novella is a stretch, but I do like that they gave it and edition. It’s a good enough story to have its own volume. As I recall, Dead Souls doesn’t fully close by the end of the book. Wasn’t it always meant to be the first volume in the story? I should do more reading about Gogol. I really only have his books under my belt when I should add a few books about him and about his work. Try Nabokov’s book – short, incisive, itself a work of art.